Monday was a Japanese holiday – Foundation Day, where the Japanese celebrate the monarchy and ascension of Emperor Jimmu, but according to my dear friend Ms. Miki Hathaway, it’s also the day General MacArthur approved the draft of the modern constitution in 1946. Lots to celebrate, and the Japanese don’t shy away from celebration. One of my favorite Japanese ways to celebrate is with the Mikoshi, or portable shrines, which they carry through the streets while dressed in traditional garb. This video was taken in Omotesando, widely regarded as the Champs Elysee of Tokyo with it’s wide, tree-lined street and excellent shopping. The shrines paraded one after the other, making their slow bouncing progress, for more than an hour. 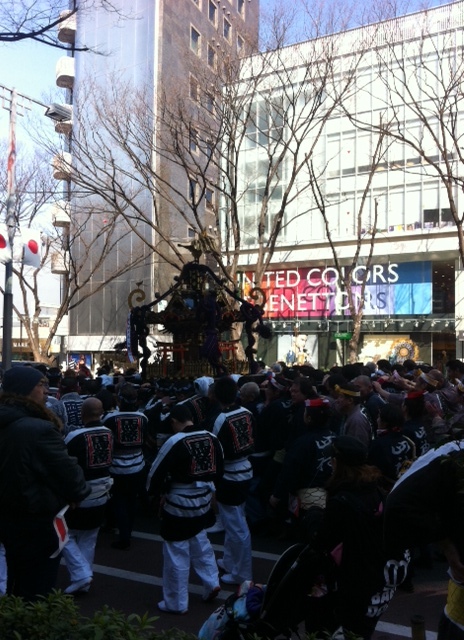 Here is a brief video of the parade of Mikoshi. Enjoy the Japanese way of celebrating a special holiday!